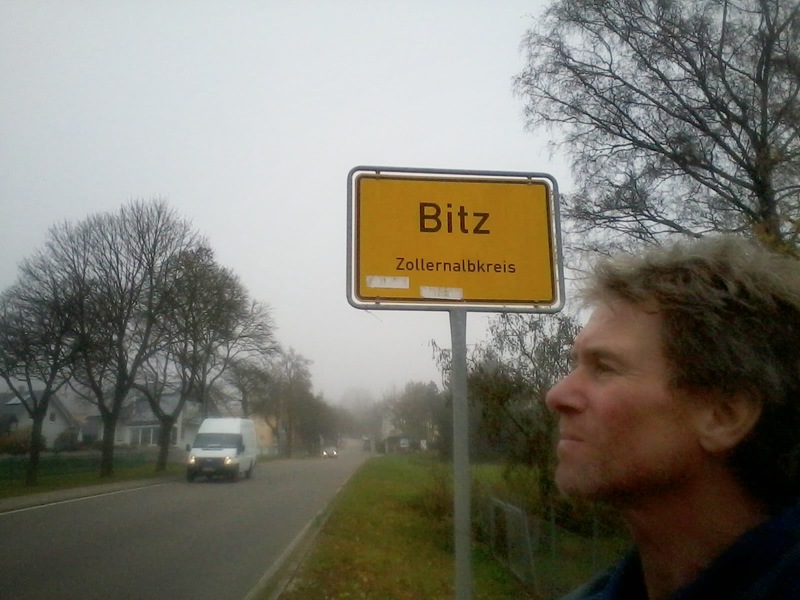 After a long morning's walk I'm in Bitz....(groan). And beyond. Almost crossed the Schwabian Alps (an 'alp' isn't a mountain as such but a high summer pasture - I passed a flock of shepherded sheep this afternoon). Next Moosewald Bergzell - more high ground, and then into the high lands of the Black Forest. 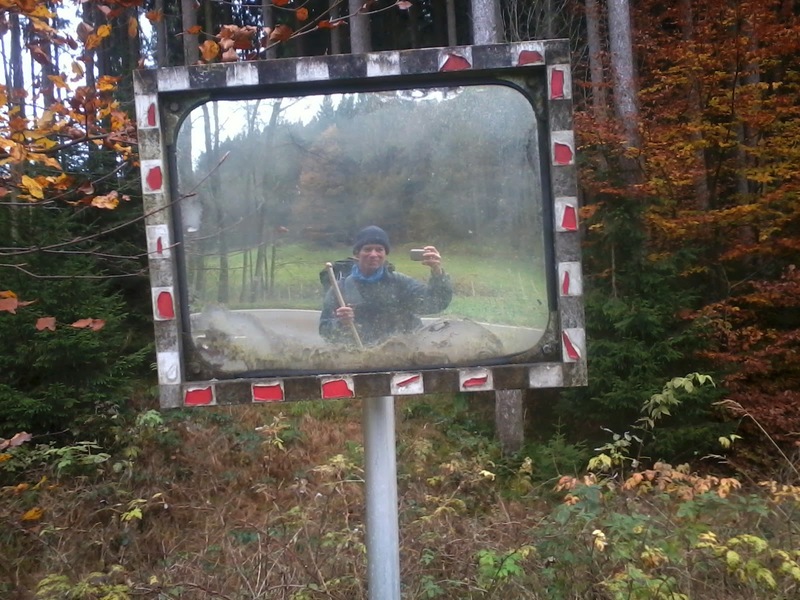 I'm starting to knock out the miles now - kept walking till late evening yesterday through small villages and dark hilly forests. At one point I came across a 'field' dotted with flickering red lights; a graveyard and tens of candles in red jars on the graves. Here's a comparison that might prove useful if you're setting off on your own sleep-out trip - with the same insulating mat and sleeping gear a hammock is colder than sleeping on the ground, but - like last night - if it's wet and sloping ground then a hammock is way more comfortable. Buzzards everywhere, because there are voles everywhere - the latter have worn runs into the matted winter grass so it's like lace. A thick fog all day until on an upland pasture the sun burnt through and it was warm and sparkling. I am honing my sense of west and find shortcuts through fields or down hills or follow paths ever towards Paris through dark forests. It's like being an animal on migration - a sense of something pulling me on. Which is good for the soul if not for the feet. Onwards. Or soon as it looks like rain and there's time for another coffee, surely. Werner Herzog is not only a man of extremes - as following his 500 mile walk between Munich and Paris is proving - but a man who provokes extremes. Since leaving Munich a week ago not one person - honestly, not one - knew of Herzog. Not even the faintest limbic recognition of his name. Until yesterday in Munderkingen when I walked into the wonderful Café Melber (opened in 1899, closed in '39 and reopened in 1999). 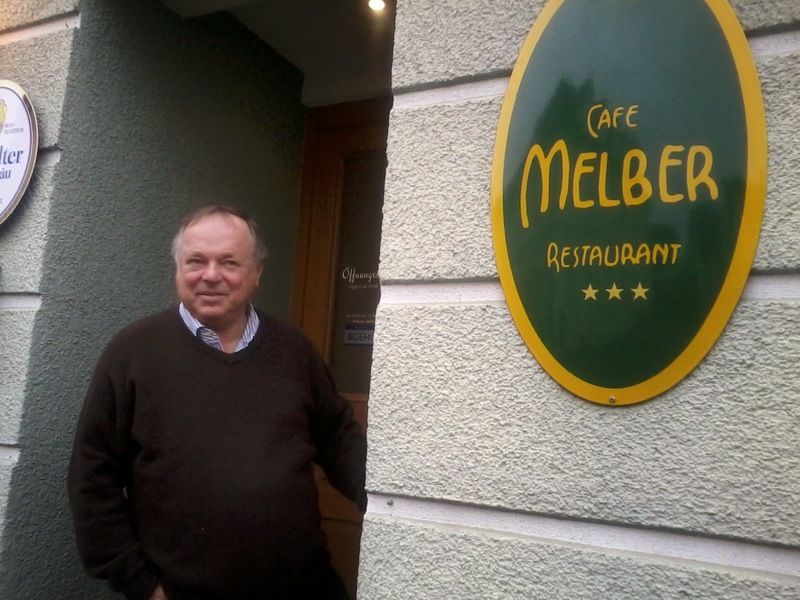 Proprietor, Herr Casper, not only knew of Herzog, but knew all his films and had met him 25 years ago at a showing of Fitzcarraldo at a local film festival. Amongst many photos of old Munderkingen, classic film stills and French art photography hung on the walls he had a portrait of a young and angelic-looking Klaus Kinsky. Herr Casper also appropriated a pretzel from the shopping of one of his regulars (who apparently had bought an Irish lordship with some friends on a whim) for my breakfast. All this set me up for a longish walk along the Danube - getting an eyeful of an early but...um...confident example of Baroque in the monastery at Untermarchtal along with the skull of Saint Tiberius - in drizzle. Later where I'd stopped under a shelter for wanderers in a small village a young woman cycled past, paused, turned back and asked if I'd like a 'hot sausage.' I thought I probably did. She pulled one out of a can hanging from her handlebars, gave it to me and cycled on. I climbed high up into a forest and camped on the hilltop by a shrine, a wooden log trough filling from a natural spring and a bench and table (the latter supported my tarp when it was time to sleep. 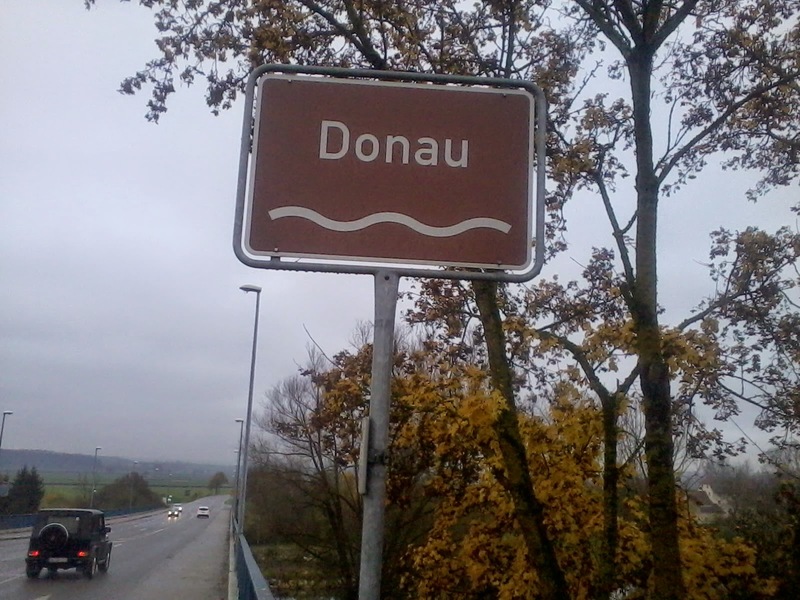 I heated soup and crumbled rye bread into it and looked out over the world below - village lights, a distant factory emitting rumbles and clatters through the night, rushing trains in the narrow Danube valley. All else was dark. To the west rose the Schwabian Alps into which I'll set off after this coffee in Zwiefalten (more Baroque - which I define a kitsch with a bigger budget). Before dawn I was woken by the barking of muntjac deer. Once up, with coffee made, I spent an hour housekeeping - amazing how much stuff accumulates in a small bag, and how muddled. Walking is only a small part of a long walk. The rest is looking for good shelter spots, making food and preparing for bad weather. The coming mountains and the - surely - coming winter weather has concentrated my mind. Herzog is a day and a half ahead of me at this point, with painful feet and appalling weather. He's spending some nights in hotels to dry out. I'm hoping to find under-roof accommodation on Sunday so I can wash my walking clothes. Yesterday in the afternoon, and then into the dark of evening I walked on in my new cheap, or cheap new but either way so far comfortable boots. It's dark by five now. It's odd to leave the lights of a village - there was no inn, no place except a bus shelter to stop - and walk into pitch darkness across open fields and then into miles of first. The track like a tunnel through towering pines. And my eyes adjust and I can see the track faintly and the shape of near trees. I walked on by instinct and hunch and was repaid. A hunter's cabin, locked (since Herzog's walk - because of his walk and break-ins? - huts and barns and holiday homes are locked and barred) but with a wide veranda. No need to put up the tarp, and there's a bench so I can sit as I cook packet soup and patch up my feet and write notes and route check the map. But it's cold and by nine I'm in my sleeping bag, wearing most of my clothes and gloves and hat. 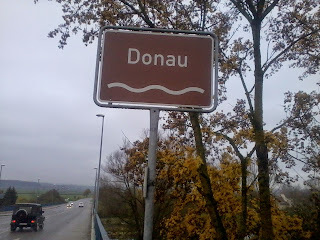 How cold will it be when I start climbing into the wilderness and high ground beyond the Danube? Well, I'll see in a day or two. I slept to the shrieks and hoots of owls, and chuffle of distant trains. I woke early 6.30, but only a short while later a forestry lorry passed; those hard working Schwabs - they're renowned for it, even by German standards. In Laupheim - where I am now - I bought more surgical alcohol. The pretty, English speaking chemist was intrigued by the walk. Like most Germans, it seems, she has no idea who Herzog is. She assured me that the alcohol was just alcohol (70%) and water with no additives. 'Don't drink it,' she warned me. Do I look like someone who'd drink medicinal hooch? Well with six days of stubbly beard and my walking clothes, very possibly. I'm thinking of inviting some other film directors along on the walk to balance out Herzog. Hitchcock says he'll pop in along the way - that may have been him in that family party in a village café. Mike Leigh wants us to make it up as we go along. Tarrantino has to get the sound track sorted first. Spielberg's just going to recreate the whole route in an LA studio; I like this idea best of all. I'm trickle buying coffees and cakes to be able to spend hours in this café charging camera batteries and phone, writing and preparing to walk on into cold fog alongside a busy road for ten miles. There's rain forecast for tonight, starting in early evening so would be good to have found a barn or some kind of lean-to or crude roof by dark. 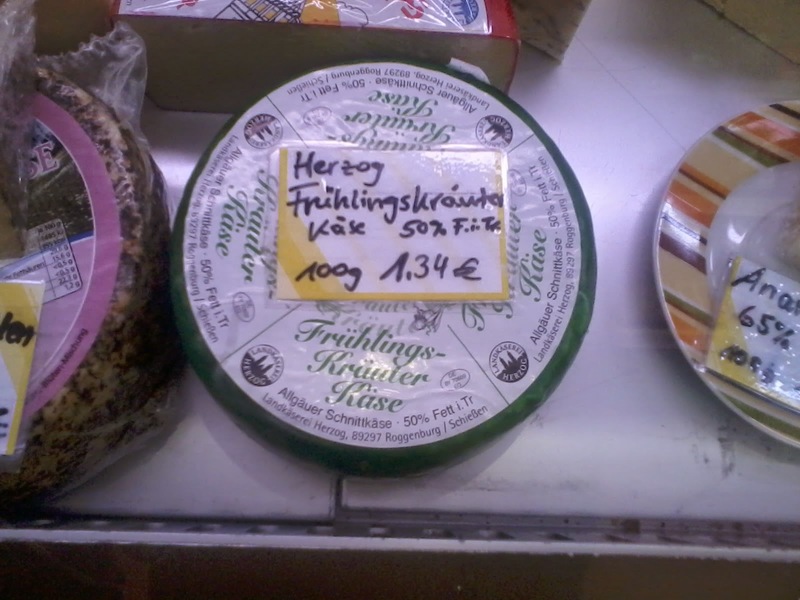 A SIGN I'M ON THE TRAIL OF HERZOG - IN THE CHEESE CABINET. 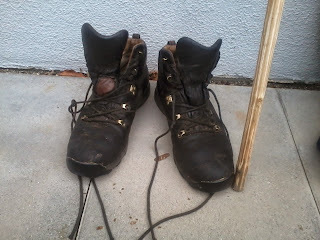 The final resting place of the best walking boots I've had. Brasher ultra-lights, and of a quality they don't make anymore. This pair have been going for over a decade and only the soles have departed. I should have got them re-soled before this stroll but didn't. Can't find anyone en route who can fix them in under several days. Sadly their last resting place is outside Lidl in Illertissen where I bought a €19 pair of leather work boots. They didn't deserve that. But then who does get the end - good or bad - they deserve? 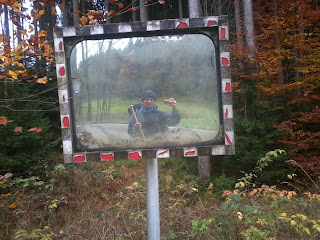 The Gasthof host where I had a few evening beers last night has been the first person to be thrilled by my walk. He kept shaking my hand, and sent me off with two miniatures of the inn's speciality schnapps; I'm curious to see if it'll work in my stove. It's a grey, damp, cold day and it's an effort to keep on. Two hours, a coffee and a weiss dunkle beer in this cheap café run by cheery, blousy Russian women ministering to tables of elderly regulars. Time to try out these new boots. 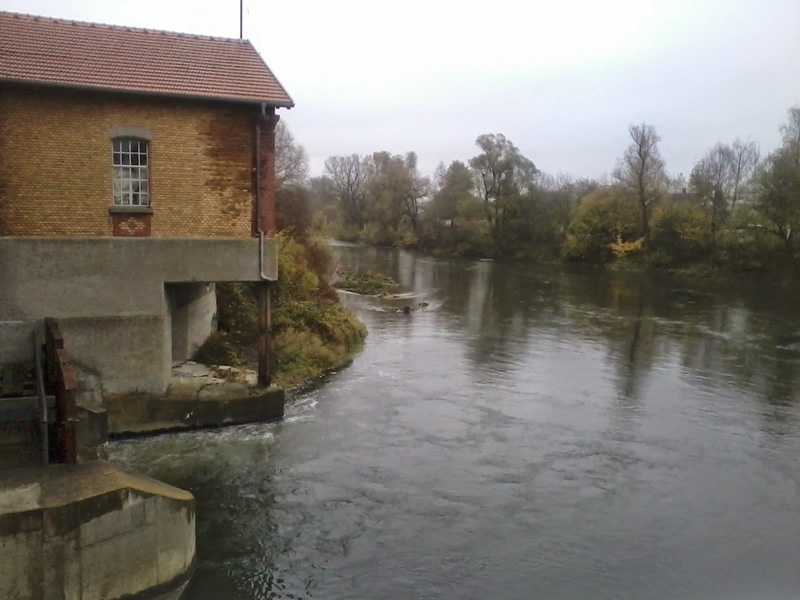 I'm crossing the Iller River, and walking off my first map and onto my second. I've only got three maps to cover the whole munich to paris distance - unfortunately having walked right across one of the three maps in six days doesn't mean I'm a third of the way. The third map - the whole French leg - is at a much smaller scale. Still, it's a map down, and all I've got to do is keep going west. For a while more. 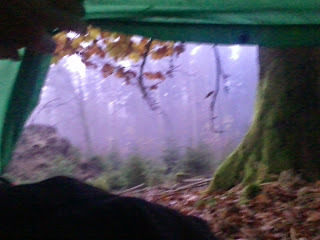 I was awake early, before dawn, before seven in my tarp camp in the lee of a hedge. I made coffee whilst sill in my bag. Grey and cloudy. Had to reach a town to get food. Have walked hard. In one village an odd man came running out to stop me. He had walked to Hamburg, because of a woman? He broke his ankle? He lives in a hospital - krankenhaus? My German is so bad. A van stopped and an owl-faced man began shouting at me. He thought I was a Jacob's Way pilgrim and needed my booklet stamped in the Rathaus - I would have to wait for the mayor. 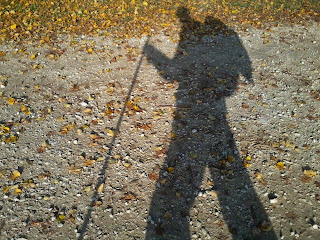 I have walked many miles on different pilgrims routes passing crucifixes, shrines, grottos and stations of the cross. 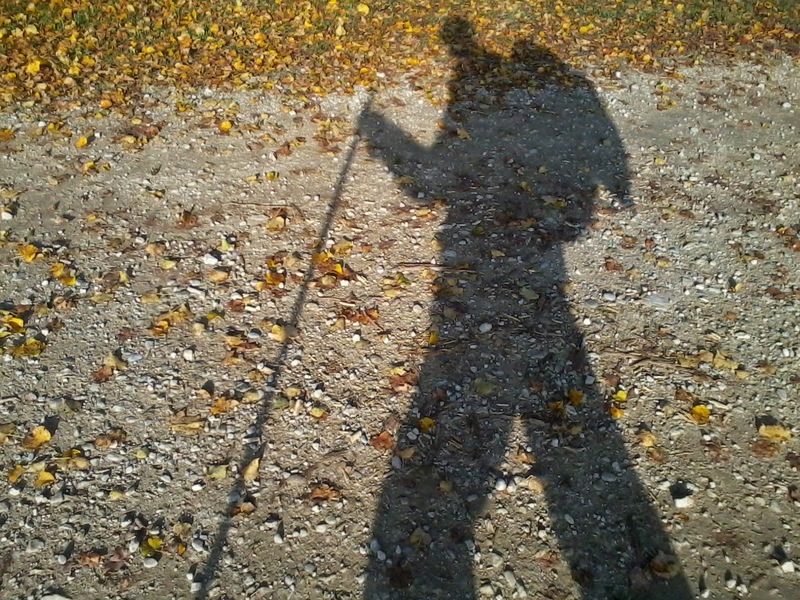 The sun came out and my shadow - or the ghost of Werner Herzog walked beside me. We all have our superstitions. My left boot sole has nearly worn through. Currently an academic problem. I asked in a cobblers about repairing my boots. Yes, indeed. They'd be sent away and back in three days. Maybe the problem isn't so academic. A cold but wonderful night in the forest. Walking at night and putting up my tarp in the dark I never quite know what I'll find in the morning. I woke at dawn in mist amongst beech and big pine trees. I made coffee whilst still a-bed to the distant sound of church bells and rifle shots. And walked out into a blue sky and bright sun day. I'm walking across country on tracks mostly, heading west with just a touch of north. Time to walk on from this inn, full of sunday lunchers fresh from church (or boar and deer shooting).